Below is an excerpt from the Illnois Vehicle Code. 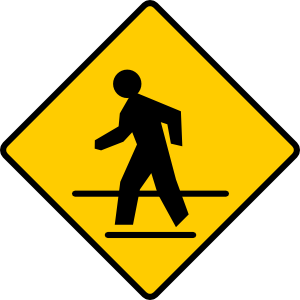 Basically, people can cross if they can get to the halfway point of the crosswalk. That’s the magically point where pedestrians gain the right-of-way. If you’re not at the halfway point of the crosswalk and a car approaches, then you could have some problems because the car has the right-of-way. So people really should not expect cars to stop for them when they are about to cross. 3. Whenever stop signs or flashing red signals are in place at an intersection or at a plainly marked crosswalk between intersections, drivers shall yield right of way to pedestrians as set forth in Section 11 904 of this Chapter. So Wheaton’s reference indicates two additional items: 1: When a car is stopped for a pedestrian, the cars behind him have to stop too and can’t try to pass (duh). 2: if there’s flashing red lights at the scene, then the car must stop. I was also inspired to look up these rules after reading Blair Kamin’s blog post on the pedestrian crossing by the Tute. That sounds to me like the cars on the side of the road the pedestrian is on need to yield to the pedestrian… not that they half to make it halfway across the road.